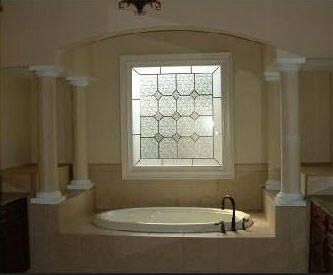 SAMUEL “K” DESIGNER WINDOWS.…Enjoy the artistic look of Beveled/Stained Glass without the expense. Revel in the glow of filtered daylight cascading through the rich colors and textures of your window while secure in its privacy. Samuel K´s architectural window films are crafted to fit any shaped opening. They are energy efficient, resistant to steam and moisture and offer protection from UV rays–an ideal solution for large Tub Garden Windows. 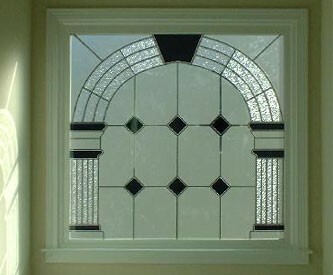 Truly a work of art, these faux Beveled/Stained Glass windows will add affordable beauty to any home!